The idea started on a college campus and grew quickly into a global event. Blake Mycoskie, TOMS’s founder and CEO, started One Day Without Shoes to send a clear message to everyone on how tough it is to spend a day without having any protection on your feet. The endeavor sheds light on how provision of basic necessities as simple as shoes will keep children in school and protect them from numerous health risks. Safeguarding the young could be as simple as protecting their soles—thus affording them more opportunities in life and better chances at growing up and growing old, happy, healthy, and out of harm’s way. Through this global movement, TOMS looks to provide a solution to this reality and everyone’s participation is the key to its success. This year’s One Day Without Shoes will be held on May 21, 4:30 PM at Track 30th, Bonifacio Global City, Taguig. The whole event brings together people from all over the world to move as one so that children in need can have better days ahead of them. In anticipation of this annual global event, TOMS is honoring everyone’s commitment to raise awareness by launching a social media campaign that challenges people from all over the world to post a photo of their bare feet on Instagram with the hashtag #withoutshoes. 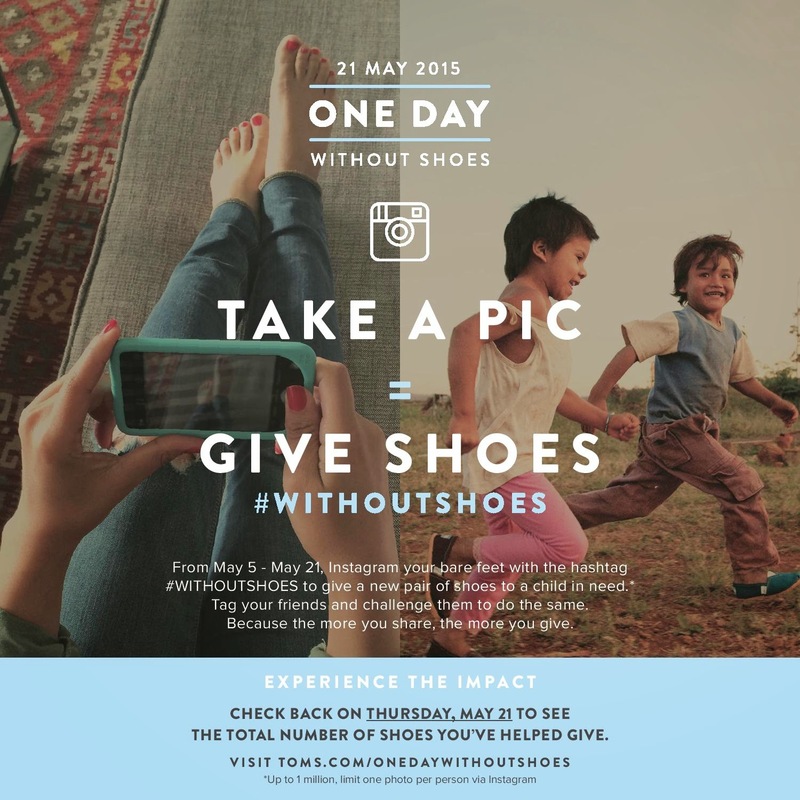 TOMS will then match each photo with a new pair of shoes, to be sent to a child in need. No purchase is required - just an open challenge given to everyone to do their part and encourage others to do the same. TOMS will also reveal the number of shoes they will give based on the participation they will receive for their online campaign. Global lifestyle brand TOMS is recognized worldwide for their unique business model that provides corresponding benefits to someone in need for every purchase of their products, One for One. They have constantly found innovative, creative and fun ways to engage people and help them become key movers in the brand’s ultimate goal: improving lives through giving. Even though years have passed since TOMS started in the business, they have remained a shining beacon of hope that inspires people to move together, for one another.